BUFF, the creator of versatile performance headwear for all-season outdoor enthusiasts and athletes, has announced the launch of its spring-summer 2018 collection of lightweight, packable and feature-heavy Run, Bike and Trek Cap line, as well as revamped UV Arm Sleeves, Trucker Caps, Water-Sports Gloves and more. The Trucker Cap (MSRP: US$28), Tech Trucker Cap (MSRP: US$28), 10-4 Tech and 10-4 Snapback caps (MSRP: US$25), aim to offer a classic style with vibrant graphics and performance features for any day out on the road, water, urban or rural. 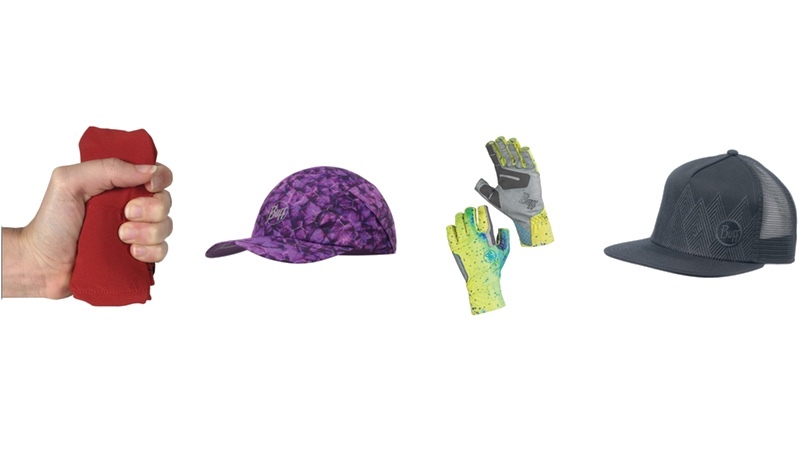 The new BUFF Glove collection offers a line of gloves for fishing and water sports that have been reimagined. From outside seams to remove chafing, to dual layering for durability, an increase in SPF for protection and new colours and styles, the result is a line of gloves that are claimed to be ‘the longest-lasting, most comfortable and highest performance water gloves found anywhere’. The collection includes the Solar (MSRP: US$20), Aqua (MSRP: US$29), Eclipse (MSRP: US$35), Fullflex (MSRP: US$35), and Elite (MSRP: US$45).